Deepavali, popularly called Diwali in some parts of India, is a festival which we all long for every year. The preparations for Deepavali start long before the festival date. Diwali is the festival of lights which is cele-brated in the month of 'Ashwin' according to Hindu calendar. 'Deepawali' in Hindi means a row of diyas. Almost every house and street is decorated with lamps and lights on the day of Diwali. Diwali is a five day festival in India. Dhanteras is the first day of Diwali. People buy jewellery, silver and gold coins on this day. On the main Diwali day idols of Ganesha and Lakshmi are worshiped. On this day Kali Puja performed in Bengal. Skies are full of blooms of crackers. 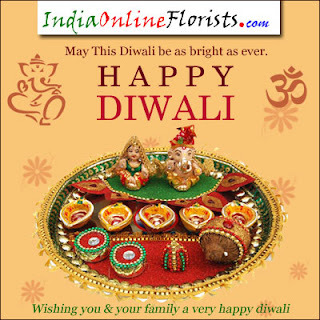 Send Diwali Gifts to India and make an excellent impression in the mind of your dear ones. Send Diwali Sweets to India and make a smile on the face of your dear ones. Send Diwali Dry Fruits to India and express the valuable feelings and wishes on Diwali. 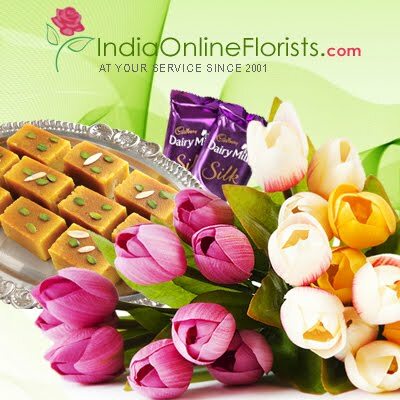 Send Diwali Mithai to India to your beloved on this prestigious Diwali and make your dear ones happy. Diwali is the most important annual festival for Hindus. There are a lot of religious and cultural beliefs behind celebrating this festival. The great cultural belief behind celebrating it is to commemorate the returning of Lord Rama to his home after 14 years of exile after defeating the demon king, Ravana. It is also celebrated as the symbol of coming of the winter season after the rainy season. It indicates the starting of new annual account for the businessmen. During this festival, people visit their relatives and friends in order to share gifts and say them good wishes for Diwali. People distribute the gift packets such as sweets, dry fruit packets, gift hampers, cakes and many other things. People offer puja to the Goddess Lakshmi to get more blessings for the bright future and prosperity. Lamps are lighted everywhere to remove the evil from home and welcome the God and Goddess. People get busy in the activities of Diwali (such as purchasing, clean up, whitewash and other religious activities) almost a month before from the real date of festival. It looks bright and dazzling everywhere because of the lighting lamps and candles. India is a land of Festivals. Many festivals are celebrated here with great zeal and excitement. Each festival has a religious or mythological significance behind it. Diwali is also one of them. It is the festival of lights. It is celebrated for several days. It is cele-brated in the month of October or early November. Diwali is a five day festival starting on the 15th day of the month Kartika (Hindu Calendar month) i.e. in the month of October or November. The legends on Deepavali differ from region to region but the essences of these legends are the same i.e. to bring out the inner light. In North India and Maharashtra, Deepavali is celebrated for more than six days. Deepavali is a wonderful festival of giving and sharing and unites the whole nation with the festivities. The magnificent celebrations of Diwali unite India irrespective of caste and creed.